Dog owners know exactly just how difficult it is to make the right choices for your pet, so that she is not only healthy and safe but also comfortable at all times. When it comes to picking the best dog bed for small dogs there are a few things that you need to consider. The bed shouldn’t be too large, because the dog might start feeling insecure, but it shouldn’t be too small either. Additionally, the bed should be able to keep your pup’s body temperature within normal limits. In other words, you should avoid materials that can cause your dog to overheat during the summer or to freeze in the cold season. 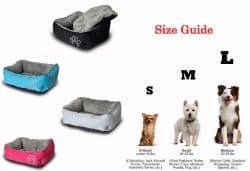 If you too are looking for the best small dog bed currently available on the market, here are our top picks. 16.8" X 16.8" X 10"
Pet Paw has been selling pet supplies for over 26 years and is considered to be one of the best distributors in the US, especially when it comes to pet beds. Their product is, without a doubt, of the highest quality. It is made out of cotton (25%), polyester (25%) and polyester filler (50%), the bottom is water resistant and it only weighs one pound. 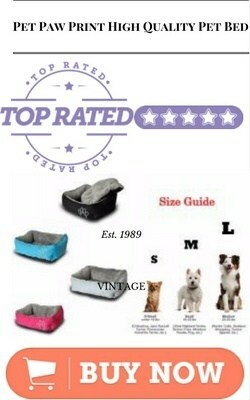 More than that, this dog bed is very easy to clean, as it can be put in the washer and tumble dried. We all know how convenient that is, especially when our beloved pets start shedding and no amount of brushing their fur will ever be enough. However, keep in mind that the bed is not orthopedic, which means that it might not be suited for elderly dogs especially after they have been on a long walk in a harness. 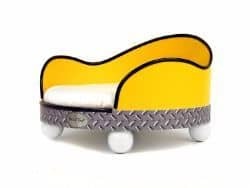 If you feel like spoiling your pet then this is definitely one of the best if not actually the best dog bed for small dogs out there! Manufactured by FrontPet, Lux is in fact an entire collection of luxurious products dedicated to dogs. This product is an orthopedic dog bed and it has 4” of memory foam that can ensure the health of your dog’s joints and bones. The slipcover is removable, which makes it easy to clean and the bottom is made out of a material very similar to rubber. This way you can be sure that the dog bed will stay put, not slip across your floors. Although the design of this dog bed is simple and can fit any type of home, you might find the lack of options when it comes to color an issue. Lux by FrontPet only comes in one single shade of grey. Enchanted Home Pet is known for their amazing designs and high quality products in general. The Artemis bed is ideal for smaller dog breeds because it is high enough off the ground to eliminate the possibility of your pet feeling any draft. You can rest assured that your dog will be as comfortable as possible in this bed. As mentioned before, the design of the Artemis bed is great and it can fit pretty much every home. If you are interested in getting your dog a bed that will also match the rest of your house then this might be the right choice for you! However, you should take note of the fact that the faux leather covering the bed is not indestructible and can be easily scratched or damaged if you have a high energy dog who likes to make a meal out of everything. K9 Ballistics’ Lux round bed could easily receive the best dog bed for small dogs award if there was one. Made out of high quality materials and rising to the highest standards, this dog bed is certainly a winner. 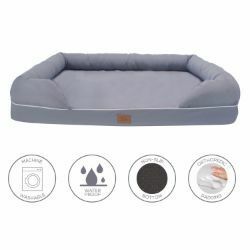 The bed is made out of hypoallergenic polyester fibers and a faux fur sleeping surface that your dog will thank you for. The mattress is especially made to resist any unpleasant odors, moisture buildup and even clumping. The Lux dog bed can also be washed quite easily. All you have to do is toss it in the washer and make sure to use cold water. The only disadvantage this dog bed has is the fact that it is only recommended to well - behaved pets. Chewing and scratching the material can damage the product, according to the manufacturer. If you are into the habit of treating your dog like some kind of member of the royal family then you are going to love this! House of Smucci has come up with a highly original and very functional bed for small dog breeds. Your dog will surely appreciate you spoiling her by getting this bed! The Yellow Truck pet bed has plastic bed frame and bed panel that are easy to wash. Given its intricate design, this dog bed might be more difficult to clean than other similar products. The pillow is made out of memory foam and the pillow cover can be removed and machine washed in cold water. This bed is the perfect combination of comfortable and great looking! 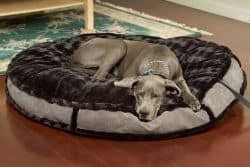 Choosing the ideal dog bed for your pet can sometimes be quite difficult, especially if you have no idea what you should be looking for. The advantage of having a small breed is the fact that you have far more options to choose from. However, having more options also means stumbling upon low quality products with questionable materials and no return policy. In order to make sure that your dog is not only well rested but also comfortable, you can limit your research to the products that we have already selected and consider to be the best on the market at the moment! 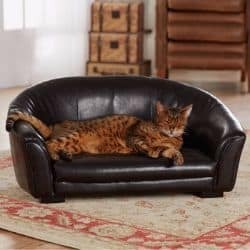 Once you have picked out the perfect bed and your little buddy is cozy at home, why not take a look at some pet carriers to keep them comfortable on your next trip.